SEATTLE (Scrap Monster) : Heaps of plastic waste are generated daily in the United States—32 million tons in 2012, according to the EPA. Less than 10 percent of plastic garbage ends up recycled as most of it is entombed forever in municipal landfills. Ford has taken a tiny step towards waste diversion by incorporating more materials made from recycled plastic in its vehicles. Yesterday the automaker announced fabric made out of recycled bottles will be used in its F-150 line of trucks. According to Ford the company is the only automobile manufacturer to use REPREVE, a fabric manufactured by Unifi, in some of its vehicles. The company claims the use of this product will prevent approximately 5 million plastic bottles from ending up in landfills. Ford’s relationship with Unifi ramped up a few years ago when the automaker selected the nylon manufacturer as its upholstery supplier for the Focus Electric model. 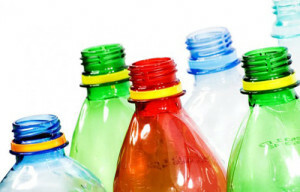 At the time Ford touted its partnership for using an average of 22 plastic bottles in each car, for a total of 2 million bottles diverted from landfills. The company has also experimented with alternatives to fossil-fuel based plastics in its vehicles, though most new materials have only made token appearances in vehicles. In fairness to the company, materials such as soy or coconut fibers are difficult to scale and do not match conventional materials in overall strength and performance. So in the grand scheme of things, will Ford’s use of plastic bottles make much of a difference on the environmental front? Of course not: 5 million bottles may ring loudly as an impressive number, but it is only the equivalent of the amount of plastic bottles Americans throw away in 12 to 13 minutes. And let’s look at the overall carbon footprint of the F-150, starting with its mileage: at 19 MPG on city streets and 26 MPG on the highway, it is an improvement over older models of trucks, but it is still relatively high compared to other vehicles on the market. And considering the demographic interested in the F-150, recycled fabric is not going to be the truck’s larger selling point anyway. While automakers, especially Ford and GM, are trying to outdo each other at almost a silly pace with how they are becoming more sustainable, you have to give them credit when it comes to recycling. Cars and trucks (if you can past their overall lifetime carbon footprint) are one of the most recyclable products on the market: 75 to 90 percent of the content of that vehicle ending up in the local junkyard can be recycled. In the case of a mothballed F-150, that number could edge up a bit. Unifi has a program that incorporates old fabric into its recycling stream, so hopefully Ford will find a way to close that loop a little tighter down the road.